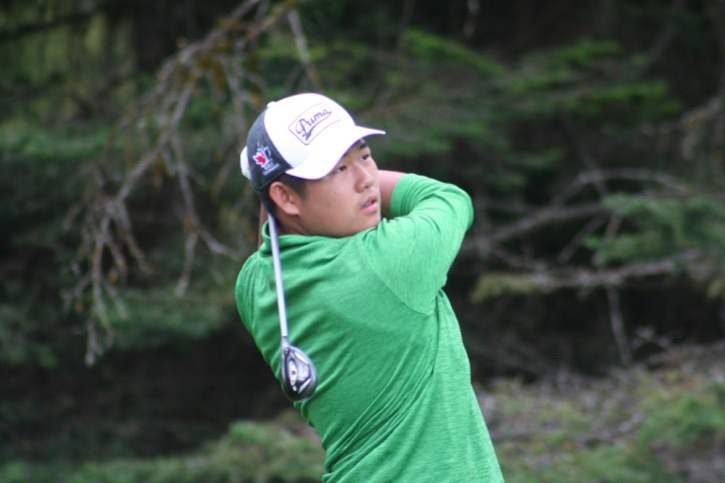 Khan Lee shot a six-under par 66 on Aug. 18 to overcome a four-stroke deficit and capture the BC Golf Association juvenile boys championship at the Chilliwack Golf and Country Club. Below: Khan in action last month at the BC Golf Association junior boys championships at Arbutus Ridge. Khan finished tied for 24th in that event. Trailing by four strokes heading into the final round, Khan Lee changed his strategy. Instead of focusing on the leaderboard — nine golfers were ahead of him — he switched to chasing the course record of nine-under par. Lee was competing at the BC juvenile boys golf championship, which was hosted by the Chilliwack Golf and Country Club Aug. 15 to 18. “I knew that I needed to go super low to actually have a chance,” he said on Friday, on his way to California for another tournament. Lee shot an opening round of 75 and followed that up with a 70. And in Thursday’s final round, he started with two birdies and two bogeys in the first six holes. But after that, Lee buckled down and made two birdies over the next four holes. He pulled even with Victoria’s Jeevan Sihota with a birdie on 14 and then closed his round with birdies on 17 and 18. Altogether, Lee finished with six birdies over his final 13 holes and it was those final two birdies which put him over the top — not for the course record but for the championship. Lee finished with a final round six-under par 66 to finish the tournament a five-under par 211. The 16-year-old admitted that while he was a bit surprised he pulled it off, he also knew he had the potential. Playing under clear skies and at times sweltering heat, there were also periods of gusting wind to fool with the players’ minds, but it didn’t affect Lee. Lee was proud of his final round but admitted he was going for the course record. “But come on, 66 in the final round of a championship, I’ll take it,” he said. Lee, who moved to Willoughby a few months ago, has golfed since he was about five years old. “I just like the moment, when you make a putt or need to make a putt. And it is full of surprises,” he explained. He is also proving to be a player to watch with a verbal commitment on a scholarship to Washington State University to join the Cougars golf team. Lee enters Grade 12 at Clayton Heights next month. Lee has spent the past five years training at the Northview Golf Academy. “He was already pretty good. He was just looking for some fitness and getting a leg up and has been working pretty hard ever since,” said Matt Palsenbarg, the director of instruction with the Tour Performance Lab at Northview. “(Khan) has definitely been one of the hardest workers we have. Three other Langley golfers finished in the top 20 with Andy Kim (Redwoods) tied for sixth at 2-over par, Jess Lee (Redwoods) was tied for eighth at 3-over par and Jackson Jacob (Lab@Northview) was tied for 19th at 7-over par. Andy Jang (Redwoods) was tied for 21st at 9-over par. The BC juvenile girls championships were also held at the Chilliwack Golf and Country Club with Langley’s Jessica Wu (Redwoods) finishing tied for seventh at 9-over. Surrey’s Hannah Lee ran away with the title, shooting a five-under par 211 to win by five strokes. Two other Langley golfers — Chaewon Baek (Swan-e-set) and Emma Yang (Redwoods) finished 13th and 19th, respectively.